Nothing exciting nor tragic has been going on in our lives lately which is more than okay with me, but it does leave little to blog about. Stephen carpooled with someone to work on Saturday and so the boys and I took advantage of having a car and went to visit my parents. 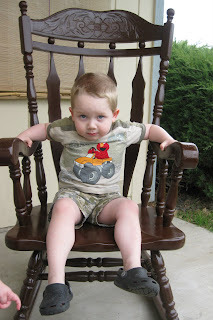 My mom had a rocking chair on her porch, but it was getting to be a crowded place to be so I took it off my hands and put it on my empty porch. We are enjoying it. I tried to get a better picture of Vance on it, but he is so busy rocking that I can't ever get a good one. Oh, if anyone is interested I am now a primary teacher (8 turning 9 class) at church. That was the class they originally called me to in my last ward, but then moved me to the Sunbeams so I guess I'm getting my chance to teach that age now. That is the class I teach in Primary now. I really like it. They are big enough to sit still and listen, at least for most of the lesson if you keep it moving. I also like seeing what is going on in Primary without my kids wanting to come and sit on my lap.